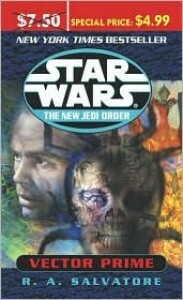 Perhaps my love of Star Wars is so strong I remembered this book better. So far this re-read has been slow. I'm about 50% done and it's slow going. Salvatore details each fight sequence with precision that seems to not draw me in so much as put me off and skip a few lines. Perhaps it's my mood or something else, but I remember this book as being full of excitement instead of a long drawn out rendering . Now I do recall the death of a main character (wont say just in case) and maybe that is making me read so slowly, my denial? still half to go and hopefully I won't find something else to distract me, except the new issue of Clarkesworld has come out so maybe after a few short stories I will appreciate Salvatore's story..